Last week, Neil Young announced that he would be releasing yet another album—a live record from one of his mid-’80s tours called A Treasure. But this is only a slice of what our favorite Canadian songwriter has been up to this year. From winning a Grammy to reuniting with Buffalo Springfield, Young has continued his busy ways a half-century into his musical career. There’s rarely a shortage of Neil Young news items given the continued consistency and excellence of this prolific songwriter. But really, do you need an excuse to reflect upon his greatest works? He has more than we can count divided among his 30-plus solo studio albums (with the exception of Everybody’s Rockin’ and a couple others). 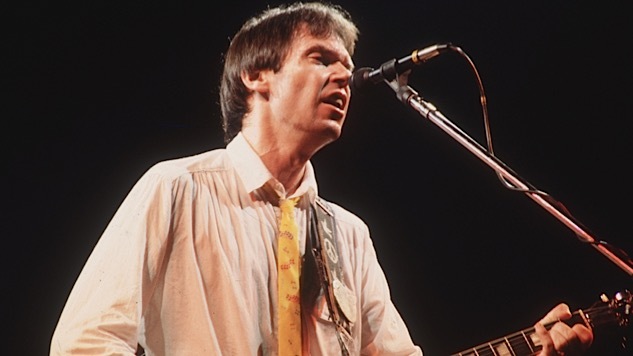 But here are our picks for the Neil Young songs that reign supreme. Young wrote this song about his experiences in what had become a creatively stagnant Crosby, Stills, Nash and Young in the mid-70’s. Off of his latest record Le Noise, “Angry World” won Young what somehow was only his second-ever Grammy this year. This Harvest-era track thankfully saw the light of the day a few years later, making the cut for the cult classic On The Beach. One of Young’s most underrated works was recently revived by Tunde Adebimpe, who covered the song in the film Rachel Getting Married. Young wrote this song in the back of his friend’s DeSoto Suburban, with his friend helping him due to his recent vocal chord operation and inability to sing for an extended period of time. The title track off his second solo LP showcases Young’s early turn toward country-rock. This nine-minute acoustic ballad broods on his past bands, critics and the way time changes both. The guitar solo introducing this 10-minute Crazy Horse collaboration makes this song all that much better. Among Young’s best acoustic works from the ‘90s. As one of the many excellent tracks off of Harvest, this one exemplifies his ability to crank out a country-rock classic with relative ease. “Tonight’s The Night” introduces us into Young’s world of grief, angst and desolation on the album of the same name. A tale of cheating, murder and arrest, one that Young supposedly wrote while delirious in bed with a 103 °F fever.